Currently, pancreas or islet transplantation is the only cure; however, this is hampered by the limited number of pancreas donors and the requirement for life-long immunosuppression.7 As a result, alternative therapeutic approaches that overcome both the requirement for immunosuppression and recurrent autoimmunity are required. Currently, a number of therapeutic approaches are under investigation including restoration of immune tolerance,8,9 endogenous β-cell regeneration,9,10 transplantation of encapsulated artificial β-cells,11,12 and the “artificial pancreas”.13,14 In addition, gene transfer of pancreatic transcription factors and insulin for the production of “artificial” β-cells that are capable of synthesizing and secreting insulin in response to metabolic signals is a promising alternative. Two common methods of generating surrogate β-cells are the dedifferentiation and directed transdifferentiation of autologous or allogeneic cells ex vivo15–17 followed by transplantation, and the in vivo18–20 transdifferentiation of target tissue via gene transfer of transcription factors or insulin within viral vectors. Animal models have been used in T1D research since the discovery of insulin by Banting and Best in 192221 for studying the pathogenesis of the disease and its complications and for the discovery of new treatments. For any diabetes research to have clinical applications, potential treatments must be performed in animal models to provide proof of the principle. The most common animal model for T1D research is the nonobese diabetic (NOD) mouse. This review will outline the common types of animal models of T1D, the generation of artificial β-cells as a promising alternative therapy for the treatment of T1D, and how animal model research is applied to demonstrate the safety and success in reversing diabetes, which are important for clinical development. 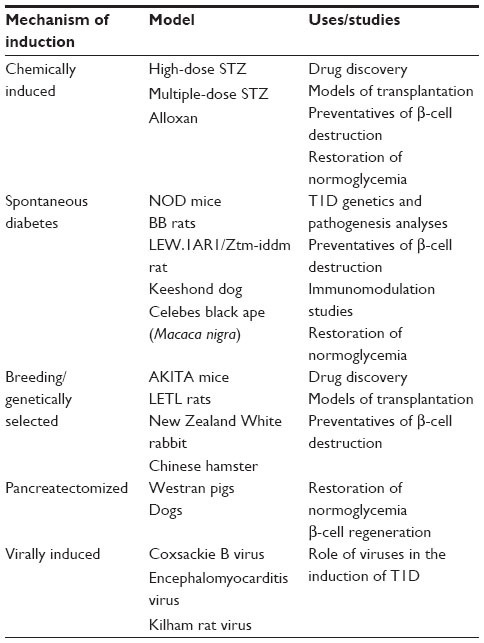 The use of animal models in diabetes research (Table 1) has been extensively pursued. Most studies are performed in small animal models such as rodents and mice to provide proof of concept for the development of Phase I clinical trials. However, large animal models of diabetes in pigs, dogs, and monkeys are becoming increasingly popular due to the criticism that rodents do not adequately represent the human condition of diabetes. Note: This table describes the most commonly used animal models for the study of Type 1 diabetes. Abbreviations: BB, biobreeding; LETL, Long-Evans Tokushima Lean; NOD, nonobese diabetic; STZ, streptozotocin; T1D, Type 1 diabetes. In addition to these main animal models of T1D, genetically and virally induced models are available for research purposes. The AKITA mouse was derived in Akita, Japan, from a C57BL/6NSlc mouse with a spontaneous mutation in the insulin 2 gene, which results in a severe insulin-dependent diabetes beginning at 3–4 weeks of age, and is used to study the success of islet transplantation.46 Since the implication of viruses in the pathogenesis of T1D, viruses have been used to induce diabetes in animal models. These include the coxsackie B virus,47 the encephalomyocarditis virus,48 and the Kilham rat virus.49 The remainder of this review will focus on the use of viral gene transfer to a variety of cell types for the production of artificial β-cells and assessment of the success of these cell therapies in animal models of diabetes via autologous or allogeneic transplantation. Viruses possess the natural capacity to infect and deliver genes to cells and, as a consequence, have been engineered to not replicate yet efficiently transduce infected cells with genes of interest for a number of purposes. The ability to integrate the genes of interest into the genome of a target cell allows for long-term expression of the transgene, resulting in a sustained therapeutic effect. The engineering of β-cells for the treatment of T1D would preferably employ integrating viral vectors to provide a sustained therapeutic benefit over the life of the patient without the need for multiple administration of the treatment. Adenoviral vectors transduce nondividing cells episomally and therefore only provide transient gene expression.50,55 In some cases, immune responses against the viral proteins have been reported,56,57 and to overcome the immunogenicity of the viral capsid proteins, a “gutless” adenovirus was developed.58 Despite displaying a reduction in immunogenicity, immunosuppressants are still required to manage immune responses activated following treatment.59 In addition, preexisting immunity to adenovirus in humans limits the use of multiple administrations of the vector that would be required for sustained therapeutic effects. The ability of adeno-associated viral (AAV) vectors to transduce both dividing and nondividing cells makes them a suitable vector of choice for gene transfer. However, they have a limited gene cargo capacity of <5 kb.60 Due to their site-specific nature of gene integration in target cells, AAV insertion sites can be predicted and potentially oncogenic consequences avoided. A study using AAV vectors to directly deliver the preproinsulin gene to livers of chemically induced STZ mice61 transiently reduced blood glucose levels, and supports the utility of AAV for insulin gene transfer. An attractive candidate for gene therapy is lentiviral vectors (LVs) because they are capable of transducing both nondividing and dividing cells.62 LVs are derived from the human immunodeficiency virus (HIV), so biosafety was a concern for their application as therapeutics. By introducing deletions in the long terminal repeat (LTR) promoter, the likelihood of generating a replication-competent virus was reduced and greater safety for clinical application was achieved.63 Within our laboratory, LV is currently the gene transfer vector of choice for corrective gene therapy. We have successfully used a LV, HMD, which has a murine stem cell virus promoter to deliver furin-cleavable insulin (INS-FUR) to the livers of STZ-diabetic rats,18 NOD mice,19 and pancreatectomized Westran pigs.20 In these animal models, we observed spontaneous expression of β-cell transcription factors, formation of storage granules, and permanent reversal of diabetes. Ultimately, T1D gene therapy aims to create artificial β-cells that reproduce the mechanism of insulin secretion that occurs normally within β-cells. Normally, insulin is initially translated as a proinsulin precursor in the endoplasmic reticulum (ER); it is then transported from the ER to the Golgi apparatus and crosses the Golgi network before being sorted into clathrin-coated immature insulin secretory granules (ISGs).84,85 Various biochemical modifications trigger the maturation of ISGs, and following glucose stimulation the mature ISGs secrete their insulin content into the extracellular space. Although the pancreatic β-cell contains ~10,000 ISGs, only 100–200 ISGs are capable of quickly releasing their insulin content in response to increases in cytosolic [Ca2+].84 This means that there is a “reserve pool” of ISGs which can be induced to release insulin, resulting in the minute-to-minute regulation of insulin secretion in response to changes in blood glucose levels. One of the major hurdles for T1D gene therapy is the inability to reproduce the regulated mechanism of insulin secretion in pancreatic β-cells. Consequently, the use of glucose-responsive promoters attached to pancreatic transcription factors or the insulin gene have been investigated in an attempt to engineer the physiologically regulated production of insulin. Notes: This table describes a number of studies utilising in vivo or ex vivo insulin gene transfer for the reversal of T1D in animal models. It does not list all studies performed in these scenarios, nor does it describe any in vitro insulin gene transfer studies. Abbreviations: BB rats, biobreeding rats; BMSC, bone marrow-derived MSC; MSC, mesenchymal stem cells; GFP-mMSC, green fluorescent protein murine mesenchymal stem cells; INS-FUR, furin-cleavable insulin; Ins, insulin; NOD, nonobese diabetic; STZ, streptozotocin; HMD, human immunodeficiency virus, murine stem cell lentiviral vector; T1D, Type 2 diabetes; Scid, severe combined immunodeficiency; GK, glucokinase; GIRE, glucose-responsive element; IPGTT, intraperitoneal glucose tolerance test; MSCV, mouse stem cell virus; AAVI, adeno-associated viral vector containing insulin and glucokinase. Investigating tissue-specific regulation of pancreatic hormones or proteins would hopefully reveal the underlying mechanisms governing the expression of those factors. As a result, the insulin promoter that is activated by glucose has been intensively studied to identify these G1REs in the hopes of better recreating the physiological regulation of insulin production.94,95 A study by Sander et al discovered a strong G1RE (Z element) in the distal region of the human insulin promoter,94 elucidating one of the mechanisms that provides glucose-sensitive regulation of insulin in primary cultured islet cells. More recently, the pancreatic-derived factor (PANDER), a newly discovered cytokine-like protein that is strictly expressed in the pancreatic islets, was analyzed for its glucose-responsive nature of expression.96 It revealed that the 5′-untranslated region of the PANDER promoter contained the G1REs that drive PANDER expression that mimic insulin expression, and that the PANDER promoter could potentially be used to drive transgenic insulin expression in alternative cell targets. One of the limitations of transcriptionally regulated insulin production in transplanted alternative cell targets is their delay in responding with immediate insulin secretion when challenged with glucose. As insulin secretion is linked to insulin transcription, the minute-to-minute glycemic control, which occurs in normal β-cells, is not present in these engineered target cells. This is due to the absence of secretory granules that store and immediately secrete insulin in response to fluctuations in blood glucose concentrations. To overcome this limitation, engineering a promoter expressing high levels of insulin in response to fluctuating glucose concentrations, yet possessing insulin-sensitivity as a feedback mechanism, could more closely mimic the normal physiology of insulin secretion. However, the successful adaptation of this technology in vivo would require the development of granules similar to ISGs to regulate glycemia. Our laboratory has shown that the ability of liver cells to store and secrete insulin, and undergo pancreatic differentiation, is linked to the induced expression of certain β-cell transcription factors. We were the first to show a number of cutting-edge developments in this field and, very importantly, have never seen the development of exocrine differentiation and tissue destruction often seen in studies of liver-directed gene therapy where Pdx-1 was used.17,97 This is, in part, due to the alternative choice of genes used for the viral delivery to hepatocytes. In several animal models, we have delivered INS-FUR, within the LV human immunodeficiency virus, murine stem cell lentiviral vector, to the liver by using a surgical technique that isolated the liver from the circulation, allowing the LV to settle in the liver without the problem of excessive inactivation from the blood. We permanently reversed diabetes in STZ-diabetic rats18 and spontaneously diabetic NOD mice.19 In both studies, we reported spontaneous expression of key β-cell transcription factors (Pdx-1, Neurog3, and NeuroD1), which are important in the development of insulin storage and regulated insulin expression in pancreatic β-cells.98–101 Some later stage transcription factors (Pax4 and Nkx2.2) were also expressed. Our lentiviral transduction procedure may have represented a cellular insult, making progenitor cells permissive to a pancreatic developmental shift. Consistent with this, expression of Pdx-1, but only at the mRNA level, was also observed after treatment with the empty vector alone. Expression of insulin was necessary for protein expression of transcription factors. There was also expression of pancreatic hormones and development of ISGs, and normal intravenous glucose tolerance tests were observed in the STZ-diabetic rat and NOD mouse (Figure 1). Furthermore, insulin expression was restricted to the liver. In the NOD mouse study, there was no evidence of intrahepatic inflammation or autoimmune destruction of the insulin-secreting liver tissue. By contrast, in our NOD mouse study and a similar study by Elsner et al, a simple injection of insulin into the portal circulation resulted in unregulated constitutive release of insulin, no pancreatic transdifferentiation, and an abnormal glucose response.19,71 Pancreatic transdifferentiation of the liver has been seen in other situations: following a dose of the hepatotoxin carbon tetrachloride102 and when oval cells were cultured in high glucose.103,104 We are yet to define the mechanism that has resulted in pancreatic differentiation in our studies, which is being analyzed at the molecular level in our laboratory. Figure 1 Plasma glucose levels following an IVGTT in NOD mice treated with INS-FUR in a lentiviral vector (HMD). 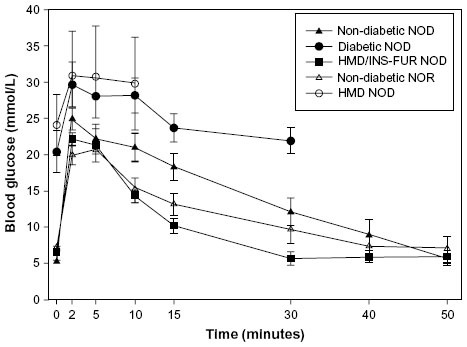 Notes: An IVGTT was performed on NOD (12–16 weeks) and NOR mice, as well as HMD-treated and HMD/INS-FUR-treated NOD mice, 5 months after reversal of diabetes. (n=5, data were examined by one-way analysis of variance after log transformation of data and expressed as the mean ± SEM). Modified from Ren B, O’Brien BA, Byrne MR, et al. Long-term reversal of diabetes in non-obese diabetic mice by liver-directed gene therapy. J Gene Med. 2013;15(1):28–41.19 Copyright © 2013 John Wiley & Sons, Ltd.
Abbreviations: IVGTT, intravenous glucose tolerance test; INS-FUR, furin-cleavable insulin; HMD, human immunodeficiency virus, murine stem cell lentiviral vector; NOD, nonobese diabetic; NOR, nonobese resistant; SEM, standard error of mean. Studies in our laboratory have also shown that these insulin-secreting liver cells are resistant to the detrimental effects of β-cell cytotoxins and proinflammatory cytokines that play a principle role in the pathogenesis of T1D.109,110 In other experiments, no infiltrates of immune cells were observed in NOD mice engineered to express insulin in their livers.19,111 These studies established that liver cells are appropriate candidates for the creation of artificial β-cells, and also highlighted that dual expression of insulin and β-cell transcription factors gave a better outcome than expression of either alone. Xu et al studied the retroviral transduction of BMSCs with an insulin gene under the control of the CMV promoter and their ability to restore normoglycemia in STZ-diabetic mice.54 It was found that these BMSCs successfully expressed insulin and were able to maintain normoglycemia for at least 42 days. In addition, the transduced BMSCs were able to evade the autoimmune destruction that ordinarily targets pancreatic islets. Figure 2 β-cell transcription factor hierarchy. Notes: Pancreatic hormone-producing cell differentiation and function is governed by the temporal and spatial expression patterns of the pancreatic transcription factors. The differentiation of insulin-producing β-cells is directed by the expression of Pdx-1, Neurog3, Neurod1, Pax4, Nkx2.2, Nkx6.1, and MafA. Once endocrine cell fate has been established, the transcription factors Pax4 and Pax6 direct the differentiation of individual hormone-producing cells.113 Differentiation of β-cells is eventually driven by the expression of Nkx2.2 and Nkx6.1. Interestingly, expression of Nkx2.2 has been observed in α and PP-cells; however, its knockout results in the disruption of the development of β-cells.119 Taken together, these results suggest that Nkx2.2 and Nkx6.1 are imperative for β-cell differentiation. 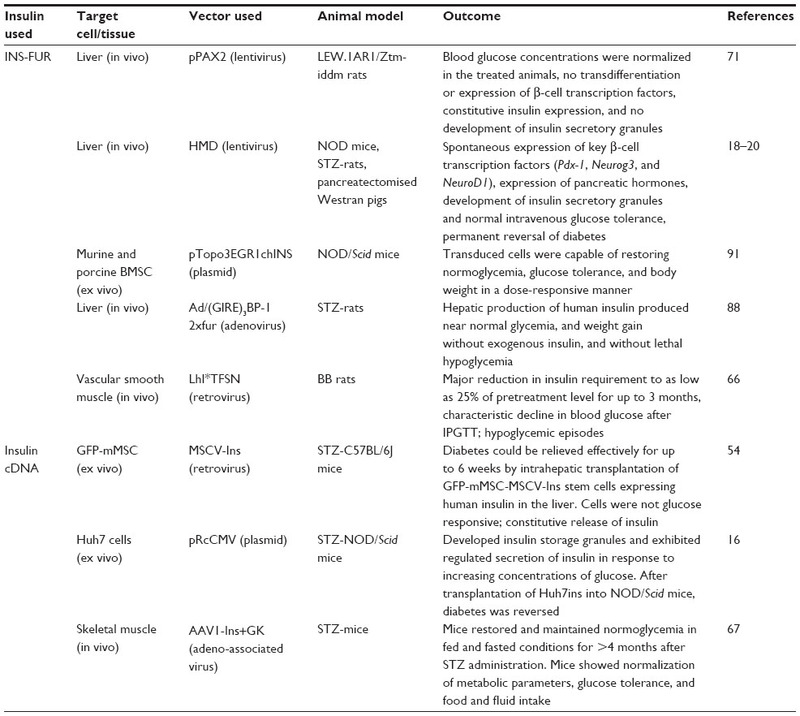 Notes: This table describes a number of studies utilising in vivo or ex vivo β-cell transcription factor gene transfer for the reversal of T1D in animal models. It does not list all studies performed in these scenarios, nor does it describe any in vitro β-cell transcription factor gene transfer studies. Abbreviations: AAV, adeno-associated virus; AMSC, adipose-derived MSC; BMSC, bone marrow-derived MSC; HDAD, helper-dependent adenovirus; MSC, mesenchymal stem cells; T1D, Type 1 diabetes; NOD, nonobese diabetic; STZ, streptozotocin; Scid, severe combined immunodeficiency; GK, glucokinase. Similarly, Kojima et al reported the development of exocrine differentiation in the livers of STZ-diabetic mice after delivering Pdx-1 with the use of a helper-dependent adenovirus.97 This was most likely due to the continuous expression of high levels of Pdx-1 as a consequence of the use of the ubiquitously expressed elongation factor-1α promoter. To date, the process of transdifferentiation from hepatocytes to pancreatic tissue via the direct delivery of Pdx-1 has been performed on multiple occasions.37,120–123 However, direct delivery of Pdx-1 has been pursued in a variety of other cell types, including mouse pancreas via the bile duct,124 rat intestinal epithelium-derived cells (IEC-6),125 and primary duct cells.126 Delivery of a combination of pancreatic transcription factors (Pdx-1, Neurog3, and MafA) was successful in converting pancreatic exocrine cells in vivo to closely resemble β-cells,127 and served as evidence for the use of transcription factor combinations. Despite the transduced cells showing all the characteristics of normal β-cells, they were limited by the low number of successfully converted exocrine cells and the fact they did not organize themselves into islet structures. Due to the success of Pdx-1 to induce pancreatic transdifferentiation and generate artificial β-cells in a number of differentiated cell types, there was a logical transition to stem cells as targets to exploit their regenerative capabilities and plasticity. Considering that MSCs possess unique immune-evading capabilities, their use as targets for gene transfer has been pursued with great interest. Pdx-1 has been delivered to MSCs from a variety of sources, including BMSC,35,128–132 umbilical cord MSC,133 and adipose-derived MSC36,134,135 with varying success in the generation of glucose-responsive artificial β-cells. Embryonic stem cells (ESCs) have also been targeted for transfer of Pdx-1, with a study by Miyazaki et al showing that a murine ESC line (EB3) could be induced to differentiate into artificial β-cells. However, due to a lack of expression of pancreatic genes in vivo, there was no therapeutic potential.136 As a result, this was followed with a number of studies in other ESC lines137–139 attempting to improve the generation of artificial β-cells that would be suitable candidates for therapeutic adaptation. Our laboratory has reported promising results using viral delivery of NeuroD1 to a genetically modified rat liver cell line (H4IIE) which does not express β-cell transcription factors. The H4IIE cells were engineered to express both insulin and NeuroD1,145 and following transduction were able to synthesize, store, and secrete insulin within storage granules. Upon transplantation in NOD/Scid mice, the cells secreted insulin in response to increasing concentrations of glucose and restored normoglycemia. They also induced the expression of Pdx-1, NeuroD1, Pax6, Nkx2.2, and Nkx6.1, in addition to rat insulin 1 and 2, glucagon, somatostatin, proconvertase 1 and 2 (PC1/2), and pancreatic polypeptide. This study provides evidence for the potential use of NeuroD1 in gene therapy protocols to induce safe differentiation. Since knockouts of Nkx6.1 in mice have shown a disruption in the development of β-cells, the use of the β-cell-specific transcription factor makes it a good candidate for gene transfer applications. It has been demonstrated that ectopic expression of Nkx6.1 alone is not a strong inducer of upper-hierarchy β-cell transcription factor expression, and that only upon coexpression with Pdx-1 was it capable of substantial insulin expression and glucose-responsive secretion of insulin.150 The lack of expression of the full hierarchy of β-cell transcription factors makes Nkx6.1 a mediocre choice for the generation of artificial β-cells for analysis in animal models of diabetes. Reversal of T1D via gene transfer in animal models has had varying success to date. The choice of the model to assess the success of any potential therapy is of significant importance, as the future clinical application of T1D therapies in humans should be primarily assessed in a model of diabetes which closely resembles the human situation. Currently, the NOD mouse model is the most widely studied and shows similar pathophysiology to human diabetes. With the development of improved molecular techniques such as generalized knock-outs, tissue-specific knockouts, and knock-ins, it should be possible to generate a large number of new animal models for specific diabetes research. Considering the autoimmune nature of diabetes, overcoming recurrent autoimmunity toward engineered cell therapies is one of the major hurdles facing this area of research. In addition, mimicking the tightly regulated control of glucose concentrations which occurs within normal β-cells is a phenomenon that has yet to be exquisitely adapted in current cell therapies. In this review, we have suggested that gene transfer of β-cell transcription factors and insulin show considerable promise in overcoming these challenges. Looking to the future, if a cell therapy is to be brought to the clinic, we believe that the targeting of an allogeneic tissue source capable of circumventing the autoimmune response for the generation of artificial β-cells shows most promise in overcoming the current challenges limiting cell and gene therapies for the treatment of T1D. Dario Gerace is supported by an Australian Postgraduate Award and the Arrow Bone Marrow Transplant Foundation/Hawkesbury Canoe Classic Scholarship. Research conducted by Ann M Simpson and Dario Gerace was supported by the National Health and Medical Research Council of Australia Project Grants (352909, 513100). Ann M Simpson and Rosetta Martiniello-Wilks also received grants from Diabetes Australia Research Trust and Rebecca L Cooper Medical Research Foundation. The authors would like to thank Richard Limburg for IT support. Ann M Simpson is an inventor in the patent “Cells genetically modified to comprise pancreatic islet glucokinase and uses thereof”; WO 2009021276 A1, Ann M Simpson and Chang Tao, European patent: EP20080782908, Australian patent: AU 2008/001160, United States of America patent: US12/672,832. The authors declare no other conflicts of interest. Atkinson MA, Maclaren NK. The pathogenesis of insulin-dependent diabetes mellitus. N Engl J Med. 1994;19(331):1428–1436. Margulies D, Ergun-longmire B, Ten S, Maclaren N. Pediatric Endocrinology, Chapter 5: Diabetes Mellitus. South Dartmouth, MA: MDText.com, Inc.; 2010. Available from: http://www.endotext.org. Melendez-Ramirez LY, Richards RJ, Cefalu WT. Complications of type 1 diabetes. Endocrinol Metab Clin North Am. 2010;39(3):625–640. Cryer PE, Davis SN, Shamoon H. Hypoglycemia in diabetes. Diabetes Care. 2003;26(6):1902–1912. Smith CB, Choudhary P, Pernet A, Hopkins D, Amiel SA. Hypoglycemia unawareness is associated with reduced adherence to therapeutic decisions in patients with type 1 diabetes: evidence from a clinical audit. Diabetes Care. 2009;32(7):1196–1198. Marzorati S, Melzi R, Citro A, et al. Engraftment versus immunosuppression: cost-benefit analysis of immunosuppression after intrahepatic murine islet transplantation. Transplantation. 2014;97(10):1019–1026. Haller MJ, Viener H-L, Wasserfall C, Brusko T, Atkinson MA, Schatz DA. Autologous umbilical cord blood infusion for type 1 diabetes. Exp Hematol. 2008;36(6):710–715. Luo X, Yang H, Kim IS, et al. Systemic transforming growth factor-β1 gene therapy induces Foxp3+ regulatory cells, restores self-tolerance, and facilitates regeneration of beta cell function in overtly diabetic nonobese diabetic mice. Transplantation. 2005;79(9):1091–1096. Tuch BE, Hughes TC, Evans MDM. Encapsulated pancreatic progenitors derived from human embryonic stem cells as a therapy for insulin-dependent diabetes. Diabetes Metab Res Rev. 2011;27(8):928–932. Jacobs-Tulleneers-Thevissen D, Chintinne M, Ling Z, et al; Beta Cell Therapy Consortium EU-FP7. Sustained function of alginate-encapsulated human islet cell implants in the peritoneal cavity of mice leading to a pilot study in a type 1 diabetic patient. Diabetologia. 2013;56(7):1605–1614. Breton M, Farret A, Bruttomesso D, Anderson S, et al; International Artificial Pancreas Study Group. Fully integrated artificial pancreas in type 1 diabetes: modular closed-loop glucose control maintains near normoglycemia. Diabetes. 2012;61(9):2230–2237. Hovorka R, Kumareswaran K, Harris J, et al. Overnight closed loop insulin delivery (artificial pancreas) in adults with type 1 diabetes: crossover randomised controlled studies. BMJ. 2011;342:d1855. Stewart C, Taylor NA, Green IC, Docherty K, Bailey CJ. Insulin-releasing pituitary cells as a model for somatic cell gene therapy in diabetes mellitus. J Endocrinol. 1994;142(2):339–343. Tuch BE, Szymanska B, Yao M, et al. Function of a genetically modified human liver cell line that stores, processes and secretes insulin. Gene Ther. 2003;10(6):490–503. Ferber S, Halkin A, Cohen H, et al. Pancreatic and duodenal homeobox gene 1 induces expression of insulin genes in liver and ameliorates streptozotocin-induced hyperglycemia. Nat Med. 2000;6(5):568–572. Ren B, O’Brien BA, Swan MA, et al. Long-term correction of diabetes in rats after lentiviral hepatic insulin gene therapy. Diabetologia. 2007;50(9):1910–1920. Ren B, O’Brien BA, Byrne MR, et al. Long-term reversal of diabetes in non-obese diabetic mice by liver-directed gene therapy. J Gene Med. 2013;15(1):28–41. Gerace D, Ren B, Hawthorne WJ, et al. Pancreatic transdifferentiation in porcine liver following lentiviral delivery of human furin–cleavable insulin. Transplant Proc. 2013;45(5):1869–1874. Banting FG, Best CH, Collip JB, Campbell WR, Fletcher AA. Pancreatic extracts in the treatment of diabetes mellitus. Can Med Assoc J. 1922;12(3):141–146. Barnes AJ, Bloom SR. Pancreatectomised man: a mode for diabetes without glucagon. Lancet. 1976;307(7953):219–221. Bono VH Jr. Review of mechanism of action studies of the nitrosoureas. Cancer Treat Rep. 1976;60(6):699–702. Dekel Y, Glucksam Y, Elron-Gross I, Margalit R. Insights into modeling streptozotocin-induced diabetes in ICR mice. Lab Anim. 2009;38(2):55–60. Nerup J, Mandrap-Poulsen T, Helqvist S, et al. On the pathogenesis of IDDM. Diabetologia. 1994;37(2):S82–S89. Szkudelski T. The mechanism of alloxan and streptozotocin action in B cells of the rat pancreas. Physiol Res. 2001;50(6):537–546. Grossman EJ, Lee DD, Tao J, et al. Glycemic control promotes pancreatic beta-cell regeneration in streptozotocin-induced diabetic mice. PLoS One. 2010;5(1):e8749. Hanafusa T, Miyagawa J, Nakajima H, et al. The NOD mouse. Diabetes Res Clin Pract. 1994;24(Suppl):S307–S311. Yoon JW, Jun HS. Cellular and molecular pathogenic mechanisms of insulin-dependent diabetes mellitus. Ann N Y Acad Sci. 2001;928:200–211. Yang Y, Santamaria P. Lessons on autoimmune diabetes from animal models. Clin Sci. 2006;110(6):627–639. Zhao Y, Jiang Z, Zhao T, et al. Reversal of type 1 diabetes via islet beta cell regeneration following immune modulation by cord blood-derived multipotent stem cells. BMC Med. 2012;10(1):3. Zhao Y, Lin B, Darflinger R, Zhang Y, Holterman MJ, Skidgel RA. Human cord blood stem cell-modulated regulatory T lymphocytes reverse the autoimmune-caused type 1 diabetes in non-obese diabetic (NOD) mice. PLoS One. 2009;4(1):e4226. Roep BO, Tree TIM. Immune modulation in humans: implications for type 1 diabetes mellitus. Nat Rev Endocrinol. 2014;10(4):229–242. Karnieli O, Izhar-Prato Y, Bulvik S, Efrat S. Generation of insulin-producing cells from human bone marrow mesenchymal stem cells by genetic manipulation. Stem Cells. 2007;25(11):2837–2844. Kajiyama H, Hamazaki TS, Tokuhara M, et al. Pdx1-transfected adipose tissue-derived stem cells differentiate into insulin-producing cells in vivo and reduce hyperglycemia in diabetic mice. Int J Dev Biol. 2010;54(4):699–705. Fodor A, Harel C, Fodor L, et al. Adult rat liver cells transdifferentiated with lentiviral IPF1 vectors reverse diabetes in mice: an ex vivo gene therapy approach. Diabetologia. 2007;50(1):121–130. Driver JP, Serreze DV, Chen YG. Mouse models for the study of autoimmune type 1 diabetes: a NOD to similarities and differences to human disease. Semin Immunopathol. 2011;33(1):67–87. Rossini AA, Handler ES, Mordes JP, Greiner DL. Human autoimmune diabetes mellitus: lessons from BB rats and NOD mice – caveat emptor. Clin Immunol Immunopathol. 1995;74(1):2–9. Prochazka M, Serreze DV, Frankel WN, Leiter EH. NOR/Lt mice: MHC-matched diabetes-resistant control strain for NOD mice. Diabetes. 1992;41(1):98–106. Nakhooda AF, Like AA, Chappel CI, Murray FT, Marliss EB. The spontaneously diabetic Wistar rat. Metabolic and morphologic studies. Diabetes. 1977;26(2):100–112. Mordes JP, Bortell R, Blankenhorn EP, Rossini AA, Greiner DL. Rat models of type 1 diabetes: genetics, environment, and autoimmunity. ILAR J. 2004;45(3):278–291. Lenzen S, Tiedge M, Elsner M, et al. The LEW.1AR1/Ztm-iddm rat: a new model of spontaneous insulin-dependent diabetes mellitus. Diabetologia. 2001;44(9):1189–1196. Kramer JW, Nottingham S, Robinette J, Lenz G, Sylvester S, Dessouky MI. Inherited, early onset, insulin-requiring diabetes mellitus of Keeshond dogs. Diabetes. 1980;29(7):558–565. Howard CF. Spontaneous diabetes in Macaca nigra. Diabetes. 1972; 21(11):1077–1090. Mathews CE, Langley SH, Leiter EH. New mouse model to study islet transplantation in insulin-dependent diabetes mellitus. Transplantation. 2002;73(8):1333–1336. Yoon J-W, London WT, Curfman BL, Brown RL, Notkins AL. Coxsackie virus B4 produces transient diabetes in nonhuman primates. Diabetes. 1986;35(6):712–716. Craighead JE, McLane MF. Diabetes mellitus: induction in mice by encephalomyocarditis virus. Science. 1968;162(3856):913–914. Guberski D, Thomas V, Shek W, et al. Induction of type I diabetes by Kilham’s rat virus in diabetes-resistant BB/Wor rats. Science. 1991;254(5034):1010–1013. Morgan RA, Anderson WF. Human gene therapy. Annu Rev Biochem. 1993;62:191–217. Bushman FD. Retroviral integration and human gene therapy. J Clin Invest. 2007;117(8):2083–2086. Cavazzana-Calvo M, Hacein-Bey S, de Saint Basile G, et al. Gene therapy of human severe combined immunodeficiency (SCID)-X1 disease. Science. 2000;288(5466):669–672. Laufs S, Nagy KZ, Giordano FA, Hotz-Wagenblatt A, Zeller WJ, Fruehauf S. Insertion of retroviral vectors in NOD/SCID repopulating human peripheral blood progenitor cells occurs preferentially in the vicinity of transcription start regions and in introns. Mol Ther. 2004;10(5):874–881. Xu J, Lu Y, Ding F, Zhan X, Zhu M, Wang Z. Reversal of diabetes in mice by intrahepatic injection of bone-derived GFP-murine mesenchymal stem cells infected with the recombinant retrovirus-carrying human insulin gene. World J Surg. 2007;31(9):1872–1882. Volpers C, Kochanek S. Adenoviral vectors for gene transfer and therapy. J Gene Med. 2004;6(S1):S164–S171. Wold WS, Doronin K, Toth K, Kuppuswamy M, Lichtenstein DL, Tollefson AE. Immune responses to adenoviruses: viral evasion mechanisms and their implications for the clinic. Curr Opin Immunol. 1999;11(4):380–386. McCaffrey AP, Fawcett P, Nakai H, et al. The host response to adenovirus, helper-dependent adenovirus, and adeno-associated virus in mouse liver. Mol Ther. 2008;16(5):931–941. Alba R, Bosch A, Chillon M. Gutless adenovirus: last-generation adenovirus for gene therapy. Gene Ther. 2005;12:18–27. Zhou HS, Liu DP, Liang CC. Challenges and strategies: the immune responses in gene therapy. Med Res Rev. 2004;24(6):748–761. Muzyczka N. Use of adeno-associated virus as a general transduction vector for mammalian cells. In: Muzyczka N, editor. Viral Expression Vectors. Vol 158. Berlin, Heidelberg: Springer; 1992:97–129. Sugiyama A, Hattori S, Tanaka S, et al. Defective adenoassociated viral-mediated transfection of insulin gene by direct injection into liver parenchyma decreases blood glucose of diabetic mice. Horm Metab Res. 1997;29(12):599–603. Yoon JW, Jun HS. Recent advances in insulin gene therapy for type 1 diabetes. Trends Mol Med. 2002;8(2):62–68. Zufferey R, Dull T, Mandel RJ, et al. Self-inactivating lentivirus vector for safe and efficient in vivo gene delivery. J Virol. 1998;72(12):9873–9880. Laub O, Rutter WJ. Expression of the human insulin gene and cDNA in a heterologous mammalian system. J Biol Chem. 1983;258(10):6043–6050. Iwata H, Ogawa N, Takagi T, Mizoguchi J. Preparation of insulin-releasing Chinese hamster ovary cell by transfection of human insulin gene. Polymers of Biological and Biomedical Significance. Vol 540. Washington, DC: American Chemical Society; 1993:306–313. Barry SC, Ramesh N, Lejnieks D, et al. Glucose-regulated insulin expression in diabetic rats. Hum Gene Ther. 2001;12(2):131–139. Mas A, Montané J, Anguela XM, et al. Reversal of type 1 diabetes by engineering a glucose sensor in skeletal muscle. Diabetes. 2006;55(6):1546–1553. Hughes SD, Quaade C, Johnson JH, Ferber S, Newgard CB. Transfection of AtT-20ins cells with GLUT-2 but not GLUT-1 confers glucose-stimulated insulin secretion. Relationship to glucose metabolism. J Biol Chem. 1993;268(20):15205–15212. Zaret KS. Genetic programming of liver and pancreas progenitors: lessons for stem-cell differentiation. Nat Rev Genet. 2008;9(5):329–340. Elsner M, Terbish T, Jorns A, et al. Reversal of diabetes through gene therapy of diabetic rats by hepatic insulin expression via lentiviral transduction. Mol Ther. 2012;20(5):918–926. Short DK, Okada S, Yamauchi K, Pessin JE. Adenovirus-mediated transfer of a modified human proinsulin gene reverses hyperglycemia in diabetic mice. Am J Physiol. 1998;275(5 pt 1):E748–E756. Vollenweider F, Irminger JC, Gross DJ, Villa-Komaroff L, Halban PA. Processing of proinsulin by transfected hepatoma (FAO) cells. J Biol Chem. 1992;267(21):14629–14636. Gebler A, Zabel O, Seliger B. The immunomodulatory capacity of mesenchymal stem cells. Trends Mol Med. 2012;18(2):128–134. Vija L, Farge D, Gautier JF, et al. Mesenchymal stem cells: stem cell therapy perspectives for type 1 diabetes. Diabetes Metab. 2009; 35(2):85–93. Abdi R, Fiorina P, Adra CN, Atkinson M, Sayegh MH. Immunomodulation by mesenchymal stem cells: a potential therapeutic strategy for type 1 diabetes. Diabetes. 2008;57(7):1759–1767. da Silva Meirelles L, Fontes AM, Covas DT, Caplan AI. Mechanisms involved in the therapeutic properties of mesenchymal stem cells. Cytokine Growth Factor Rev. 2009;20(5):419–427. Lee RH, Seo MJ, Reger RL, et al. Multipotent stromal cells from human marrow home to and promote repair of pancreatic islets and renal glomeruli in diabetic NOD/scid mice. Proc Natl Acad Sci U S A. 2006;103(46):17438–17443. Ezquer FE, Ezquer ME, Parrau DB, Carpio D, Yanez AJ, Conget PA. Systemic administration of multipotent mesenchymal stromal cells reverts hyperglycemia and prevents nephropathy in type 1 diabetic mice. Biol Blood Marrow Transplant. 2008;14(6):631–640. Tang DQ, Cao LZ, Burkhardt BR, et al. In vivo and in vitro characterization of insulin-producing cells obtained from murine bone marrow. Diabetes. 2004;53(7):1721–1732. Oh S-H, Muzzonigro TM, Bae S-H, LaPlante JM, Hatch HM, Petersen BE. Adult bone marrow-derived cells trans-differentiating into insulin-producing cells for the treatment of type I diabetes. Lab Invest. 2004;84(5):607–617. Wu XH, Liu CP, Xu KF, et al. Reversal of hyperglycemia in diabetic rats by portal vein transplantation of islet-like cells generated from bone marrow mesenchymal stem cells. World J Gastroenterol. 2007;13(24):3342–3349. Sun Y, Chen L, Hou XG, et al. Differentiation of bone marrow-derived mesenchymal stem cells from diabetic patients into insulin-producing cells in vitro. Chin Med J. 2007;120(9):771–776. Brunner Y, Coute Y, Iezzi M, et al. Proteomics analysis of insulin secretory granules. Mol Cell Proteomics. 2007;6:1007–1017. Howell SL. The mechanism of insulin secretion. Diabetologia. 1984;26(5):319–327. Lee HC, Kim SJ, Kim KS, Shin HC, Yoon JW. Remission in models of type 1 diabetes by gene therapy using a single-chain insulin analogue. Nature. 2000;408(6811):483–488. Thule PM, Liu J, Phillips LS. Glucose regulated production of human insulin in rat hepatocytes. Gene Ther. 2000;7:205–214. Thule PM, Liu J. Regulated hepatic insulin gene therapy of STZ-diabetic rats. Gene Ther. 2000;7:1744–1752. Mitanchez D, Doiron B, Chen R, Kahn A. Glucose-stimulated genes and prospects of gene therapy for type I diabetes. Endocr Rev. 1997;18(4):520–540. Chen R, Meseck M, McEvoy RC, Woo SL. Glucose-stimulated and self-limiting insulin production by glucose 6-phosphatase promoter driven insulin expression in hepatoma cells. Gene Ther. 2000;7(21):1802–1809. Chen NK, Tan SY, Udolph G, Kon OL. Insulin expressed from endogenously active glucose-responsive EGR1 promoter in bone marrow mesenchymal stromal cells as diabetes therapy. Gene Ther. 2010;17(5):592–605. Harada S, Smith RM, Smith JA, Shah N, Hu DQ, Jarett L. Insulin-induced egr-1 expression in Chinese hamster ovary cells is insulin receptor and insulin receptor substrate-1 phosphorylation-independent. Evidence of an alternative signal transduction pathway. J Biol Chem. 1995;270(44):26632–26638. Rees DA, Alcolado JC. 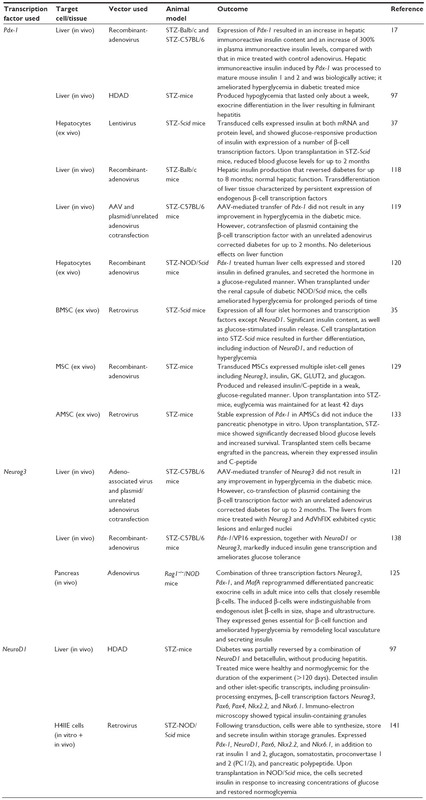 Animal models of diabetes mellitus. Diabet Med. 2005;22(4):359–370. Sander M, Griffen SC, Huang J, German MS. A novel glucose-responsive element in the human insulin gene functions uniquely in primary cultured islets. Proc Natl Acad Sci U S A. 1998;95(20):11572–11577. Burkhardt BR, Loiler SA, Anderson JA, et al. Glucose-responsive expression of the human insulin promoter in HepG2 human hepatoma cells. Ann N Y Acad Sci. 2003;1005:237–241. Burkhardt BR, Yang MC, Robert CE, et al. Tissue-specific and glucose-responsive expression of the pancreatic derived factor (PANDER) promoter. Biochim Biophys Acta. 2005;1730(3):215–225. Kojima H, Fujimiya M, Matsumura K, et al. NeuroD-betacellulin gene therapy induces islet neogenesis in the liver and reverses diabetes in mice. Nat Med. 2003;9(5):596–603. Nathwani AC, Tuddenham EG, Rangarajan S, et al. Adenovirus-associated virus vector-mediated gene transfer in hemophilia B. N Engl J Med. 2011;365(25):2357–2365. Lisowski L, Dane AP, Chu K, et al. Selection and evaluation of clinically relevant AAV variants in a xenograft liver model. Nature. 2014; 506(7488):382–386. Apelqvist A, Li H, Sommer L, et al. Notch signalling controls pancreatic cell differentiation. Nature. 1999;400(6747):877–881. Sommer L, Ma Q, Anderson DJ. 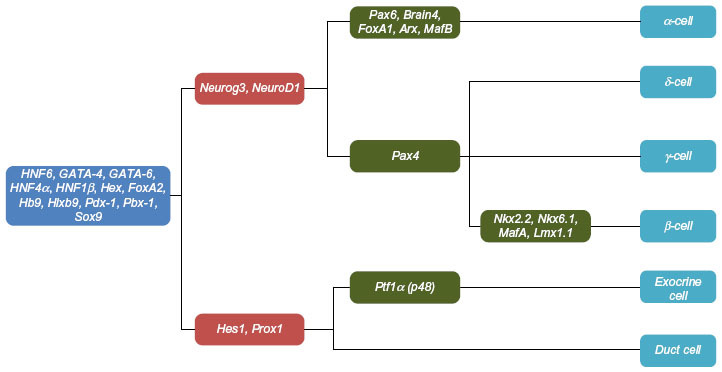 Neurogenins, a novel family of atonal-related bHLH transcription factors, are putative mammalian neuronal determination genes that reveal progenitor cell heterogeneity in the developing CNS and PNS. Mol Cell Neurosci. 1996;8(4):221–241. Shanmukhappa K, Mourya R, Sabla GE, Degen JL, Bezerra JA. Hepatic to pancreatic switch defines a role for hemostatic factors in cellular plasticity in mice. Proc Natl Acad Sci U S A. 2005; 102(29):10182–10187. Kim S, Shin J-S, Kim H-J, Fisher RC, Lee M-J, Kim C-W. Streptozotocin-induced diabetes can be reversed by hepatic oval cell activation through hepatic transdifferentiation and pancreatic islet regeneration. Lab Invest. 2007;87(7):702–712. Yang L, Li S, Hatch H, et al. In vitro trans-differentiation of adult hepatic stem cells into pancreatic endocrine hormone-producing cells. Proc Natl Acad Sci U S A. 2002;99(12):8078–8083. Han J, McLane B, Kim E-H, Yoon J-W, Jun H-S. Remission of diabetes by insulin gene therapy using a hepatocyte-specific and glucose-responsive synthetic promoter. Mol Ther. 2011;19(3):470–478. Tatake RJ, O’Neill MM, Kennedy CA, et al. Glucose-regulated insulin production from genetically engineered human non-beta cells. Life Sci. 2007;81(17–18):1346–1354. Tudurí E, Bruin JE, Kieffer TJ. Restoring insulin production for type 1 diabetes. J Diabetes. 2012;4(4):319–331. Hsu P-J, Kotin R, Yang Y-W. Glucose- and metabolically regulated hepatic insulin gene therapy for diabetes. Pharm Res. 2008;25(6):1460–1468. Tabiin MT, Tuch BE, Bai L, Han XG, Simpson AM. Susceptibility of insulin-secreting hepatocytes to the toxicity of pro-inflammatory cytokines. J Autoimmun. 2001;17(3):229–242. Tuch BE, Beynon S, Tabiin MT, Sassoon R, Goodman RJ, Simpson AM. Effect of beta-cell toxins on genetically engineered insulin-secreting cells. J Autoimmun. 1997;10(3):239–244. Tabiin MT, White CP, Morahan G, Tuch BE. Insulin expressing hepatocytes not destroyed in transgenic NOD mice. J Autoimmune Dis. 2004;1(1):3. Sander M, German MS. The beta cell transcription factors and development of the pancreas. J Mol Med. 1997;75(5):327–340. Chakrabarti SK, Mirmira RG. Transcription factors direct the development and function of pancreatic beta cells. Trends Endocrinol Metab. 2003;14(2):78–84. Ang SL, Wierda A, Wong D, et al. The formation and maintenance of the definitive endoderm lineage in the mouse: involvement of HNF3/forkhead proteins. Development. 1993;119(4):1301–1315. Korolija M, Hadzija MP, Hadzija M. Molecular mechanism in beta-cell development: the role of Pdx1, Ngn3 and Pax4 proteins. Period Biol. 2009;111(1):59–63. Gasa R, Mrejen C, Lynn FC, et al. Induction of pancreatic islet cell differentiation by the neurogenin-neuroD cascade. Differentiation. 2008;76(4):381–391. Naya FJ, Huang HP, Qiu Y, et al. Diabetes, defective pancreatic morphogenesis, and abnormal enteroendocrine differentiation in BETA2/neuroD-deficient mice. Genes Dev. 1997;11(18):2323–2334. Sander N, Sussel L, Conners J, et al. Homeobox gene Nkx6.1 lies downstream of Nkx2.2 in the major pathway of beta-cell formation in the pancreas. Development. 2000;127(24):5533–5540. Ber I, Shternhall K, Perl S, et al. Functional, persistent, and extended liver to pancreas transdifferentiation. J Biol Chem. 2003;278(34):31950–31957. Wang AY, Ehrhardt A, Xu H, Kay MA. Adenovirus transduction is required for the correction of diabetes using Pdx-1 or Neurogenin-3 in the liver. Mol Ther. 2007;15(2):255–263. Sapir T, Shternhall K, Meivar-Levy I, et al. Cell-replacement therapy for diabetes: generating functional insulin-producing tissue from adult human liver cells. Proc Natl Acad Sci U S A. 2005;102(22):7964–7969. Nagaya M, Katsuta H, Kaneto H, Bonner-Weir S, Weir GC. Adult mouse intrahepatic biliary epithelial cells induced in vitro to become insulin-producing cells. J Endocrinol. 2009;201(1):37–47. Taniguchi H, Yamato E, Tashiro F, Ikegami H, Ogihara T, Miyazaki J. Beta-cell neogenesis induced by adenovirus-mediated gene delivery of transcription factor pdx-1 into mouse pancreas. Gene Ther. 2003;10(1):15–23. Yoshida S, Kajimoto Y, Yasuda T, et al. PDX-1 induces differentiation of intestinal epithelioid IEC-6 into insulin-producing cells. Diabetes. 2002;51(8):2505–2513. Noguchi H, Xu G, Matsumoto S, et al. Induction of pancreatic stem/progenitor cells into insulin-producing cells by adenoviral-mediated gene transfer technology. Cell Transplant. 2006;15(10):929–938. Zhou Q, Brown J, Kanarek A, Rajagopal J, Melton DA. In vivo reprogramming of adult pancreatic exocrine cells to b-cells. Nature. 2008;455(7213):627–632. Sun J, Yang Y, Wang X, Song J, Jia Y. Expression of Pdx-1 in bone marrow mesenchymal stem cells promotes differentiation of islet-like cells in vitro. Sci China C Life Sci. 2006;49(5):480–489. Limbert C, Path G, Ebert R, et al. PDX1- and NGN3-mediated in vitro reprogramming of human bone marrow-derived mesenchymal stromal cells into pancreatic endocrine lineages. Cytotherapy. 2011;13(7):802–813. Moriscot C, de Fraipont F, Richard M-J, et al. Human bone marrow mesenchymal stem cells can express insulin and key transcription factors of the endocrine pancreas developmental pathway upon genetic and/or microenvironmental manipulation in vitro. Stem Cells. 2005;23(4):594–603. Li Y, Zhang R, Qiao H, et al. Generation of insulin-producing cells from PDX-1 gene-modified human mesenchymal stem cells. J Cell Physiol. 2007;211(1):36–44. Li L, Li F, Qi H, et al. Coexpression of Pdx1 and betacellulin in mesenchymal stem cells could promote the differentiation of nestin-positive epithelium-like progenitors and pancreatic islet-like spheroids. Stem Cells Dev. 2008;17(4):815–823. He D, Wang J, Gao Y, Zhang Y. Differentiation of PDX1 gene-modified human umbilical cord mesenchymal stem cells into insulin-producing cells in vitro. Int J Mol Med. 2011;28(6):1019–1024. Baer PC. Adipose-derived stem cells and their potential to differentiate into the epithelial lineage. Stem Cells Dev. 2011;20(10):1805–1816. Lin G, Wang G, Liu G, et al. Treatment of type 1 diabetes with adipose tissue-derived stem cells expressing pancreatic duodenal homeobox 1. Stem Cells Dev. 2009;18(10):1399–1406. Miyazaki S, Yamato E, Miyazaki J-I. Regulated expression of pdx-1 promotes in vitro differentiation of insulin-producing cells from embryonic stem cells. Diabetes. 2004;53(4):1030–1037. Lavon N, Yanuka O, Benvenisty N. The effect of overexpression of Pdx1 and Foxa2 on the differentiation of human embryonic stem cells into pancreatic cells. Stem Cells. 2006;24(8):1923–1930. Vincent R, Treff N, Budde M, Kastenberg Z, Odorico J. Generation and characterization of novel tetracycline-inducible pancreatic transcription factor-expressing murine embryonic stem cell lines. Stem Cells Dev. 2006;15(6):953–962. Raikwar SP, Zavazava N. PDX1-engineered embryonic stem cell-derived insulin producing cells regulate hyperglycemia in diabetic mice. Transplant Res. 2012;1(1):19. Kaneto H, Nakatani Y, Miyatsuka T, et al. PDX-1/VP16 fusion protein, together with NeuroD or Ngn3, markedly induces insulin gene transcription and ameliorates glucose tolerance. Diabetes. 2005;54(4):1009–1022. Song YD, Lee EJ, Yashar P, Pfaff LE, Kim SY, Jameson JL. Islet cell differentiation in liver by combinatorial expression of transcription factors neurogenin-3, BETA2, and RIPE3b1. Biochem Biophys Res Commun. 2007;354(2):334–339. Heremans Y, Van De Casteele M, in’t Veld P, et al. Recapitulation of embryonic neuroendocrine differentiation in adult human pancreatic duct cells expressing neurogenin 3. J Cell Biol. 2002;159(2):303–312. Yechoor V, Liu V, Espiritu C, et al. Neurogenin3 is sufficient for transdetermination of hepatic progenitor cells into neo-islets in vivo but not transdifferentiation of hepatocytes. Dev Cell. 2009;16(3):358–373. Yatoh S, Akashi T, Chan PP, et al. NeuroD and reaggregation induce β-cell specific gene expression in cultured hepatocytes. Diabetes Metab Res Rev. 2007;23(3):239–249. Simpson AM, Tao C, Swan MA, Ren B, O’Brien BA. An engineered rat liver cell line H4IIEins/ND reverses diabetes in mice. In: International Diabetes Federation World Diabetes Congress; 2009; Montreal. Abstract no MT-0996. Liew CG, Shah NN, Briston SJ, et al. PAX4 enhances beta-cell differentiation of human embryonic stem cells. PLoS One. 2008; 3(3):e1783. Blyszczuk P, Czyz J, Kania G, et al. Expression of Pax4 in embryonic stem cells promotes differentiation of nestin-positive progenitor and insulin-producing cells. Proc Natl Acad Sci U S A. 2003;100(3):998–1003. Stachelscheid H, Wulf-Goldenberg A, Eckert K, et al. Teratoma formation of human embryonic stem cells in three-dimensional perfusion culture bioreactors. J Tissue Eng Regen Med. 2013;7(9):729–741. Hentze H, Soong PL, Wang ST, Phillips BW, Putti TC, Dunn NR. Teratoma formation by human embryonic stem cells: evaluation of essential parameters for future safety studies. Stem Cell Res. 2009;2(3):198–210. Gefen-Halevi S, Rachmut IH, Molakandov K, et al. NKX6.1 promotes PDX-1-induced liver to pancreatic beta-cells reprogramming. Cell Reprogram. 2010;12(6):655–664.